Jesse Cameron-Glickenhaus wears black and red high top Converse “Chuck Taylor” All Stars in the film. Jesse meets up with Isaiah, a collector of human contestants for virtual reality games. 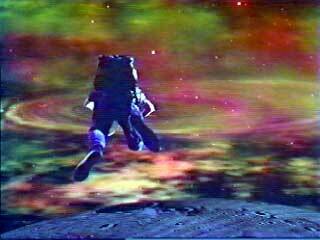 Timemaster opens in a desolate looking Yellowstone Park in the year 2007. The world has been destroyed by some sort of disaster, and the few remaining survivors are living in a “Mad Max” type of world, where they camp out in the ruins to defend themselves from raiders. Narration from a man who identifies himself as the Chairman (Michael Dorn) is heard explaining the premise of the film: on a far away planet, a group of aliens play games that affect the past, present, and future destiny of the universe. The aliens send “collectors” through space and time to planets where there are life forms to collect them as contestants or actually pawns for these virtual reality games, since the contestants really do not have free will over the outcomes. The Chairman continues by saying how Earth has been a very fertile source of life forms for their games, which have created wars, assassinations, and other forms of havoc on the planet. The aliens bet on the outcome of these games with “blue”, the distilled substance of eternal life which is extracted from the losers of the game. Isaiah (Pat Morita), their main collector on earth has been sent to gather the final contestants for thermonuclear war, which will then finish off earth. But Isaiah has become disenchanted with the games, and their intent to destroy Earth, and he plans to bring Jesse (Jesse Cameron-Glickenhaus) who he believes can successfully challenge the outcome of the games, and stop the destruction of earth. The Chairman is one step ahead, collecting Jesse’s parents as contestants in the game on his planet, while he sends Jesse and his sister Veronica (Vanessa Cameron-Glickenhaus) back in time as orphans. The Chairman says that although Isaiah may teach Jesse how to time travel, he won’t be able to stop the aliens from playing out their plan to destroy Earth. We then see his collectors invade the camp at Yellowstone, and eventually take Jesse’s parents back to their game arena, where Jesse’s mother Evelyn (Joanna Pacula) is put into a new reality game with a contestant named Mordor. The game is set in the Old West of the late 19th century and includes Jesse and his father Jonathan (Duncan Regehr) as characters in a battle of townspeople, gunfighters, and outlaws. In a past dimension, Jesse helps his very sick father into a water bath. If all of this seems confusing, don’t worry, it is. 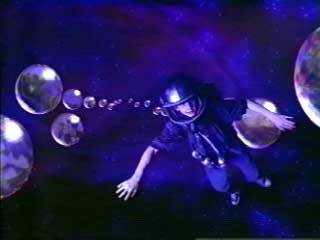 Timemaster takes several viewings to figure out, and even then it really doesn’t make a lot of sense. 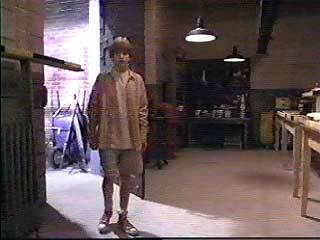 After these opening sequences, we then see Jesse and his sister at an orphanage in 1996. Jesse is told that a family has agreed to take him, but he will be separated from his sister. Not wanting that to happen, Jesse escapes that night where he runs into Isaiah, who shows him how to enter the time travel port. 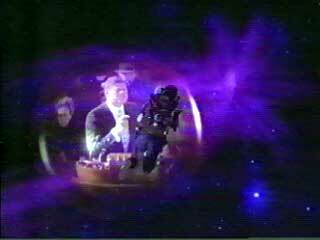 The film then has its most clever sequence, as we see Jesse travel through a space-time continuum (see photos below) where the history of Earth appears in bubbles along the way. Jesse’s first stop is back in the Old West, where he has to help his father recover from the wounds received in the gun battle game described above, and finish the wild west story with the assistance of Billy the Kid. He also meets up with Annie (Michele Williams) who he brings with him through the time portal after he finishes “fixing history” in the Old West. Jesse climbs a ladder to enter the time portal while Annie looks on. Jesse and Veronica learn their fate at the orphanage where they live in another dimension. Timemaster is another family affair film by writer-director James Glickenhaus. Just like his film Slaughter of the Innocents, he stars his son Jesse Cameron-Glickenhaus in the film as the main character and the one with the most intelligence or insight about what is going on. 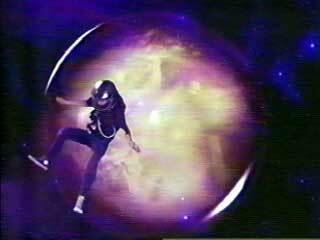 In Timemaster he also gives his daughter the role as Jesse’s younger sister Veronica. There are some good special effects in the film, and some interesting action scenes. It’s too bad that the story line wasn’t refined or simplified to make more sense, give it some cohesiveness, and allow the viewer to build up more of an emotional attachment to the principal characters. There are quite a few quotes from other films in the process, (Back to the Future and Frequency immediately come to mind). 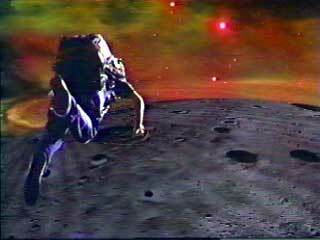 The main problem facing viewers of Timemaster is that the storyline never decides which genre it wants to be in — science fiction or action/adventure — and as a result is never totally convincing in either genre. But it’s worth a look, especially if you enjoy time travel adventure films. Jesse walks into the lab where his adventure began. Jesse climbs the orphanage wall to tell Veronica that he is leaving to try and better their situation. 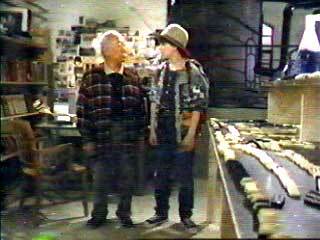 Jesse Cameron-Glickenhaus wears black or red high top chucks throughout most of the film, depending on what time dimension he is currently in. 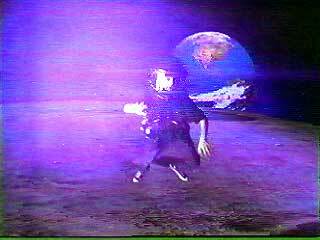 The camera work is generally chucks-friendly when he is wearing them, and the best scene is the sequence where Jesse enters the time portal for the first time, and we see him floating through the dimensions of earth in his black high tops. 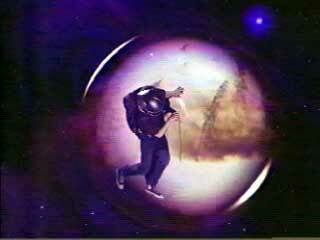 It looks like it would be a lot of fun to float through space in in your chucks. One of the coolest shots is where he bumps into a bubble representing the 1960s and you see John Kennedy giving a speech. 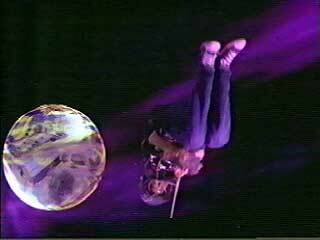 Jesse travels through the different dimensions of the earth. Click on the thumbnails to see each picture. Timemaster. (1995) Jesse Cameron-Glickenhaus, Pat Morita, Joanne Pacula, Duncan Regehr, Michael Dorn, Michele Williams. Directed by James Glickenhaus. Categories: Action/Adventure, Science Fiction/Fantasy.